is quoted extensively (especially in atheist circles). 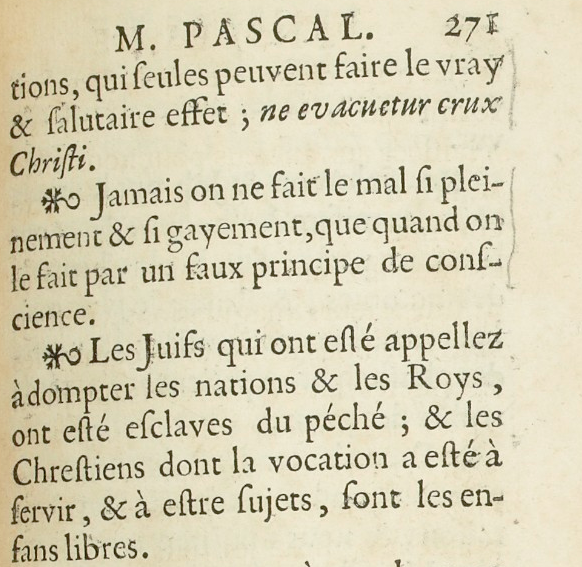 This has always puzzled me, because I've read (many years ago) the Pensées in Spanish, and I didn't remember this, and it seemed hard (for me at least) to reconcile this affirmation with Pascal's beliefs - after all, his book is an apology of Christianity. It looks quite different to me. Can someone clarify this? Is the text above the real original source? Is this translator's liberty, an error or what? Update: 1. To add to the accepted answer, after several years, here I found the original, with critical transcription and modern transcription (it coincides with my quote -in French- above). Jamais on ne fait le mal ſi pleinement & ſi gayement, que quand on le fait par un faux principe de conſcience. So to me it looks like more than a translator liberty: more like a deliberate falsification. But the French version which you found is simplified: it's missing "un faux principe de" ... so the atheist' English version may (instead of being a falsification) be just a misinterpretation of that or of some other simplified version. A photo of this sentence can be found on page 271 of the First edition on Gallica. In the 1990s, decisive philological achievements were made, and the edition by Philippe Sellier of the book contains his "thoughts" in more or less the order he left them. So for a more modern version you might want to try to find that, which is available here (or a larger version with more background information reviewed here and available here). The structure of the apology Pascal intended is best described by H. F. Stewart D.D. in the preface to his translation of the Pensees: Part I shows "from Nature" that man is wretched without God, Part II shows "from Scripture" that Jesus is the Redeemer of mankind. Part I subdivides into Ia (man without God) and Ib (man with God) to show man's inherent wretchedness. The themes of Part I are largely in the tone of vanitas mundi, after the tradition of the Hebrew Bible's book of Ecclesiastes, while the many short maxims inserted into the text are reminiscent of the Book of Proverbs. For the non-Old-French speakers, would you care to hazard a more appropriate translation? One never does evil so fully and gaily, as when one does it through a "false principle of conscience." IMO only a atheist with no sense of history or of the text could translate or interpret "false principle of conscience" there as "religious conviction". Other translations of "conscience" include "mind" or "awareness": it's saying that what a person thinks or believes can be mistaken. There are three ways to believe: reason, custom, and inspiration. The Christian religion, which alone has reason, doesn't admit as its true children those who believe without inspiration. It's not that she (i.e. the Christian religion) excludes reason and custom: on the contrary, one must open one's spirit to proofs by reason, and confirm oneself there by custom (or "habit"); but she wants that one offers oneself by humiliation (or "humility") to inspirations, which alone can make the true and salutary effect; "lest the cross of Christ be emptied" (Latin quoting 1 Corinthians 1:17). All the religions and sects of the world had natural reason for their guide. Only Christians have been compelled to take their rules from outside themselves, and to inform themselves with those [rules] which Jesus Christ has left to the ancients to be transmitted to us. There are some people who are tired (or "weary", "jaded", or "bored") of this constraint. They want to have, like other peoples, the liberty to follow their imaginations. It's in vain that we cry to them, as the Prophets did formerly to the Jews: go into the [middle/environment/society of the] Church; inform yourself of the laws which the ancients left (i.e. gave or transmitted to) her (i.e. the Church), and follow her pathways. They reply like the Jews: we will not walk there; we want to follow the thoughts of our hearts, and be like the other peoples.